The many haunted places in Illinois you can visit attest to the high amount of paranormal activity in the area. Illinois is home to several haunted cemeteries, such as Bachelor's Grove Cemetery. For some spine-tingling virtual ghost hunting, enjoy the following tales of spooky haunted locations in Illinois. Haunted places in Illinois include cemeteries, schools, hospitals, and even a haunted silo. In addition to haunted Bachelor's Grove Cemetery, Illinois has well over a dozen haunted cemeteries. 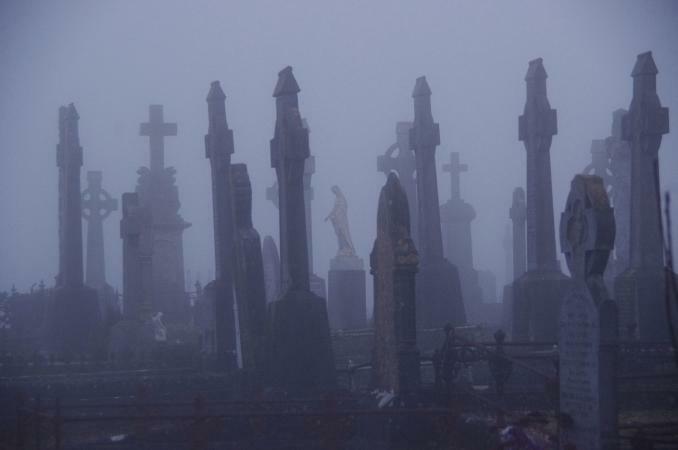 The three examples below offer very unique types of haunted cemeteries. In the Alsip area, the Burr Oak Cemtery features poltergeist-like activity. Cemetery visitors to Illinois' largest cemetery report knocks, bangs and whistles among the headstones. People hearing these noises claim they cannot attribute them to people, wind, or weather conditions. Residents of homes bordering the old cemetery also report objects moving mysteriously, and hearing strange voices and whispers. Wauconda Cemetery features a very disgruntled ghost. Said to be the ghost of a pedestrian struck by a train, he appears in the back of the cemetery walking along a straight-line path until he vanishes. Local historians confirm that the path he walks follows the old railway line that once ran through the cemetery property that was dismantled long ago. No mention of haunted Illinois cemeteries would be complete without Decataur's Greenwood Cemetery. Native Americans originally used the land as a burial ground, followed by the early settlers. Ghosts include a phantom bride, phantom mourners, and strange ghost lights glowing over the graves. Meat packing workers, farmers and teachers continue to haunt their work places in Illinois. Such dedicated workers may be hard to find among the living, but among the dead they appear common in Illinois. Workers spend more than half of their waking hours at work every day, and sometimes more. They share common bonds of laughter and tears with their coworkers. Sometimes those workers just won't leave even after quitting time. The Danzeisen Meat Packing Plant (no longer in business) may have been one such place. Rumors of men who entered the plant and came out packaged quite differently, perhaps as sausage, are probably only the result of overactive minds. But for years, witnesses described paranormal activity near the old elevator, especially after the packing plant went out of business. The doors opened and closed by themselves, and the old elevator cranked its way upward without the aid of a human operator. Other witnesses heard bangs and shouts from unoccupied floors. Cold drafts were common in the old building, as well as tools going missing. It's difficult to do business in a building when the former workers don't want you there. Al Capone and his men hit the SMC Cartage Company on Valentine's Day in 1929, killing seven men in cold blood. As the years passed and the building changed hands, one entrepreneur decided to set up the site as a 1920s theme restaurant. No matter how many times one particular wall was cleaned, bloodstains would reappear. The wall has since been torn down, but pedestrians report screams and the sound of gunfire, particularly near the anniversary of the shootings. Along Shoe Factory Road in Barrington, Illinois, the haunted silo marks the place where an unidentified farmer is said to have killed his wife in a fit of jealous rage. Locals swear that the corn grows in a five-pointed star pattern in the field near where he buried his wife. The old silo, the site of the murder, is always cold, even in the middle of a blazing July day. Visitors frequently notice orbs and strange lights, and they report hearing mocking laughter. Schools are the source of much joy and misery in childrens' lives. Haunted schools are more common than most people think. Spirits of children and former teachers continue to roam the halls long after the dismissal bell has rung. The Milton School, located in Alton, provides ghost hunters with many opportunities to gather evidence. Cold spots are common, as are odd feelings of being watched, touched or poked. The Bartonville State Hospital provided a model facility for the care of the mentally ill at the turn of the 20th century. None other than the hospital's chief physician, Dr. Zeller, documented the most famous haunting at Bartonville. A patient called Bookbinder died. Bookbinder attended many funerals of his fellow patients, always standing by an elm tree during the funerals. At Bookbinder's own funeral, witnesses heard crying and saw an apparition standing by the elm tree. Dr. Zeller and over a dozen hospital staff saw the apparition and documented the sighting. Later, after the hospital closed as a medical facility, reputable paranormal investigators photographed what they believe was an actual apparition within the old hospital itself. Many more haunted locations in Illinois are documented along with these in Weird Illinois and Haunted Places of Illinois.